NEUNUNDNEUNZIG (99) is a kinetic sound sculpture by Martin Bricelj Baraga and Olaf Bender (Raster-Noton). It is comprised of a matrix of 99 balloons composing an immersive yet intimate performance. While being inflated, the balloons surround visitors to create an intense physical, sonic, and visual experience. NEUNUNDNEUNZIG (99) is a dark field of intensities where sound, light, and objects are inhaling, exhaling, and pulsating in a space that is shrinking and extending, thus creating a highly intensive, even claustrophobic psycho-physical and socio-spatial experience that mirrors the current conditions of our society. How did this project come into being? In what way did it reference German pop singer Nena’s hit 99 Luftballons, which was an anti-nuclear protest song written in the midst of the Cold War? MBB: Obviously there’s a reference to this song, but I’ve had this idea for many years. The reference to Nena’s song, or let’s say to the Cold War, is too narrow. I wanted to build this grid of 99 balloons as an environment in which we would trigger intensities and anxieties, which are not only alluding to this Cold War state we are facing again now, but more the general state of things that are happening today. There’s a broader way to read into it – it could also point to the US prisons in Guantanamo or the alienation of individuals. So you feel this polarisation of the world from the times when Nena wrote this song in the early 80s, is coming back now? MBB: When I had this idea, it was several years ago and I kind of sensed the tension. You could feel it from the vocabulary of western media. Today it’s so obvious, it’s more like violence on every level. Can you describe the concept and workings of the project? MBB: First of all, it’s a kinetic sound sculpture and an immersive intimate environment. In the grid, the balloons act as instruments but they only work in a seated space. I’m also interested in having it in a smaller room that provides more intensity even without the the moving parts. People would be moving. I see two ways – a seated, very tense situation, and the other is where you can explore the spatial acoustic intensity of the balloons that surround you. Can you talk about your collaboration with Olaf Bender, aka Byetone, one of the co-founders of the Raster-Noton label? MBB: We wanted to do something for a long time and Olaf was interested in making something outside of the club context. We are coming from different countries – Germany on the one hand, and a Slavic country on the other, but we do have some similarities in common in how we view the world and have a different perspective than people from the western hemisphere. Regardless of whether this is an ethical position or solely aesthetic, it was interesting for me to collaborate with Olaf in this grid of 99 balloons, and I immediately thought of him in the very beginning. 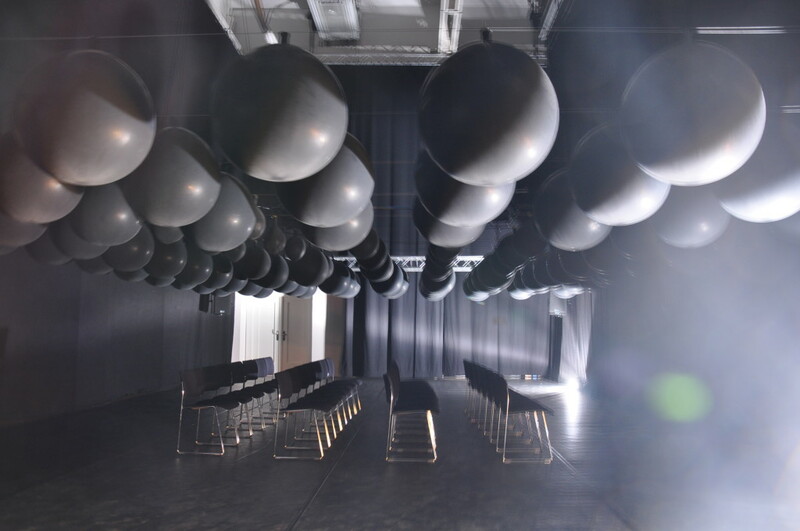 We had a short residency in Ljubljana at the Museum of Transitory Art, where we created a model for the work, which was a construction of 9 balloons, written for four people only. 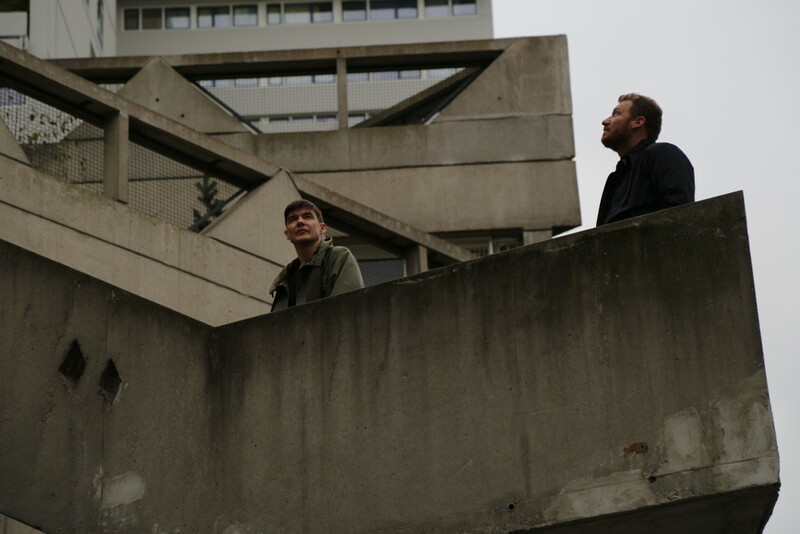 It was a really intimate piece which we presented in a military bunker in the centre of Ljubljana, a tense concrete environment. Olaf wrote the sound design and the rhythmical part, me and Igor Vuk, the technical director of the museum, wrote the additional rhythmical, kinetic part. 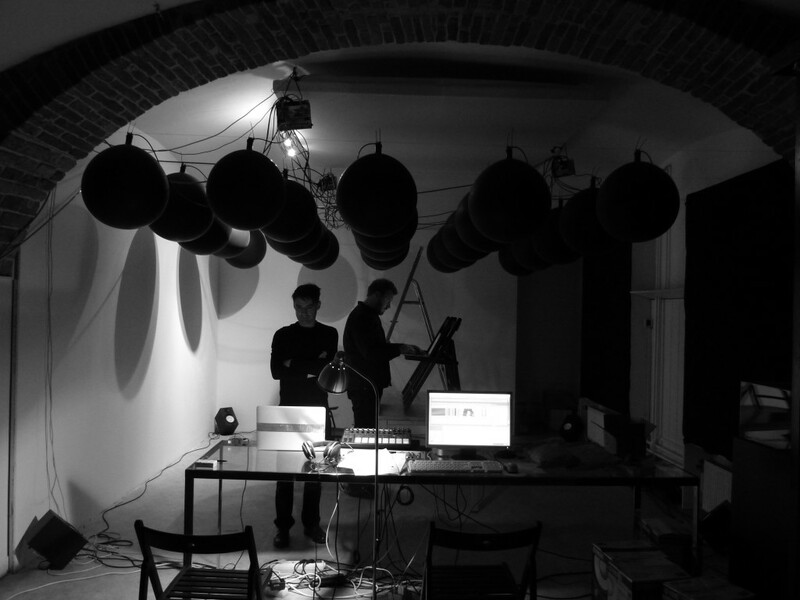 Raster-Noton has a very specific approach to sound and sound architecture. How did this influence the sonic side of your project? MBB: That was one of the reasons why I decided to work with Olaf. There’s a very minimal set of expressive tools that we we have at hand – we have the sound coming from the speakers, the sound of the balloons which are all in a grid. At first, Olaf only wrote the sound design for the speakers. This time he was also working on the composition of the compressors or the ventilation systems. You always have certain qualities of the sub-bass and frequency of the speakers. We are using very mechanical metal valves which create beautiful sounds. In combination with the speakers, the inhaling and exhaling of valves reminds of mechanical insects. And the effect it tries to conjure is claustrophobia? MBB: Yes, intensity, anxiety, claustrophobia. But in a way it’s also nice to play with a state which leads from anxiety into a more meditative mode. It’s also a very individual experience – everyone has a different interpretation of it (balloons referencing the crisis, etc), but in the end it could just be abstract and personal. How will you continue the project? MBB: I’m interested in a purely spatial or mechanical version which works as a sculpture with only ventils without any sound system, but also in a more dense, military bunker as the perfect spot. With NEMO Biennale, the co-producer of the piece, we are showing the piece at Galerie Fernand Leger in France. Later it will be great to have this piece installed in different environments, but we will also start developing a very simple, bright version with a different setup. We’re discussing some ideas where we will use the sound hemisphere of inside balloon and this will be a starting point for the adaptation. What have been some of the audience reactions? MBB: I think it’s mixed. In the bunker, the initial reactions were of people being afraid and then, later, they got excited and wanted more. Is this immersive effect also a statement against the modern-day distractedness? MBB: Yes. The first version was 9 minutes long, this one is 15 minutes. What we want is that people enter in total darkness, don’t use their phones and are surrounded by 4 balloons. The intro is very long, and you only hear the inhaling sounds which could also be a reference to some unpleasant gas experiences. I’m interested in creating a zone environment where you don’t have a constant influx of information and distractions which we are always exposed to. Are you also taking into considerations elements of chance? MBB: I’ve been working with interactive installations for more than 15 years in a set of different experiments and installations and for me it’s only interesting to see these works if they are different every time, or the audience interacts in a different way. It’s closer to nature. But unpredictability is more a process than a result. The project is shown on 26/10/2015 as part of Biennale Némo at Galerie Fernand Leger in France.